Get a movie voucher worth Rs.150 on every purchase. 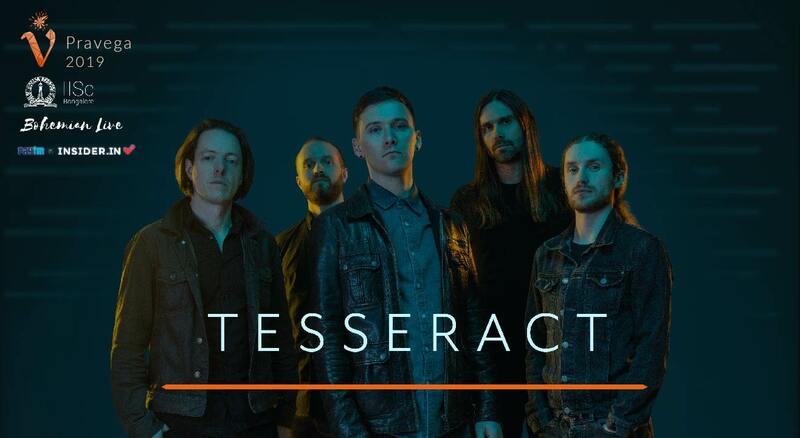 Pravega presents to you one of the pioneers of the Djent movement; a Prog-Metal band from the UK, TesseracT! With live albums like “Odyssey” and acclaimed studio albums including “Sonder” and “Polaris”, they’ll be performing live in namma Bengaluru! The band consists of Daniel Tompkins (lead vocals), Alec "Acle" Kahney (lead guitar & producer), James Monteith (rhythm guitar), Amos Williams (bass, backing vocals), and Jay Postones (drums, percussion); and has performed in over 30 tours and fests all around the world. As a part of Pravega, the Indian Institute of Science’s Annual Science and Cultural Fest, we present to you TesseracT! On the final evening of the Fest, the Winner of Pravega’s Battle of Bands will open for this internationally acclaimed band. The venue will be surrounded by several food-trucks and bite-camps for you to indulge when exhausted from all the head banging. And the faster you book your tickets, the better the deal gets for you! Note: Students and faculty of IISc, NIAS, NCBS, ICTS, JNCASR and RRI are requested to refer to the Terms and conditions before purchasing tickets. Pravega 2019 is proud to have the collaboration of Girish and the Chronicles with Baiju Dharmajan as part of our Pronites lineup, to open for TesseracT on the 20th of January, in the IISc Gymkhana Ground. Baiju Dharmajan, affectionately referred to as the God of Small Strings, is a hugely popular guitarist in the Indian music industry for both his work with the band Motherjane as well as his solo project, the Baiju Dharmajan Syndicate. His unique style of blending Carnatic styles into his riffs and solos has received worldwide appreciation. Girish Pradhan is a widely-acclaimed rock musician from Sikkim, and his band, Girish and the Chronicles (abbreviated to GATC), have been known for their immense stage presence since their formation as Revolving Barrel in the year 2006. ​Their style of hard rock and metal is influenced strongly by 70s and 80s music in the genre, and they have achieved great success with the style, winning recognition and awards both nationally and internationally. Together, they are undoubtedly one of India’s finest collaborations, and we guarantee an explosive performance like no other. Pravega is the Annual science, cultural and technical festival of the Indian Institute of Science, Bangalore. 2. Do Pravega participants get free tickets? No, if you are not in the mentioned institutes (refer T&Cs), you will need to purchase tickets. 3. Are there any VIP tickets/passes? No, unless you are on the guest list mentioned by the artists or Pravega 2019. There are Meet and greet passes that you can purchase instead.